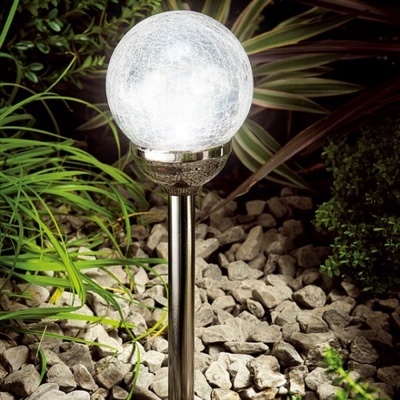 Cole & Bright Solar Ice Orb Single Stem Light - Black Nickel offers a distinctive outdoor white LED crackle glass ball light on a nickel steel stem. Creates a solar powered marker trail for garden pathways, or simply as a feature within a a flower bed. Includes a colour changing option to give a choice of light effects, that illuminates from the crackled glass. Black nickel effect finished stem and surround is a popular choice, which supports the waterproof light on top. Single light stem supplied, however additional lights can be added to illuminate a nighttime walk through a garden or pathway. Solar power charges the batteries, which then automatically lights up during darkness and goes off when light appears. Requires AA batteries (set included).